We are SO excited to show you what comes in our Extraordinary Adventure Family Game Night Box. These boxes start shipping on March 15, 2019. All boxes ordered after March 15 will ship within 2-3 business days. We have a limited number of these family game night boxes, so when they are gone… they are GONE! With every family game night box we sell, we donate $1 to Extra Life. 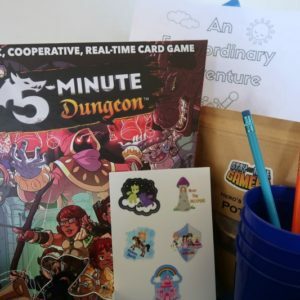 5 Minute Dungeon (cooperative game) Learn how to play 5 Minute Dungeon and watch us play it as a family. specially for our game night box by Ashleigh of InBooze. The laser engraved pencils were custom made for us by Lizz of PewPew Lasercraft. The coloring sheets, printable activities, stickers, and button pin were designed by Darcy. 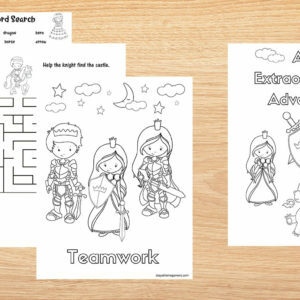 The Extraordinary Adventure printable activities are also sold separately from the box. Our family game night box helps you plan fun family time together and also helps your kids work on important social and academic skills. Are you ready to go on an extraordinary family adventure?